Three of the five miniseries collected in Convergence: Zero Hour Book One take place in one way or another in the shadow of "Death of Superman" and the destruction of Coast City. Though 1990s comics don't always get their due, this evokes compelling memories of that era of DC Comics, when the Superman, Batman, Green Lantern, Green Arrow, Flash, and New Titans titles were all toward the top of their games. This collection of miniseries is a mixed bag, as might be expected, but the highs are high -- Suicide Squad by Frank Tieri and Catwoman by Justin Gray. 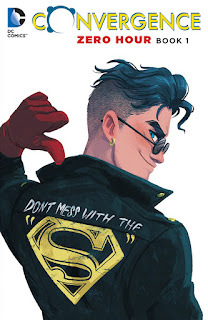 Only, unfortunately the miniseries I most looked forward to, Superboy, disappoints, shirking some of the very continuity I had hoped it would take up. A nice surprise right at the beginning of this book is Justin Gray's Catwoman. The purple-suited Catwoman is hardly my favorite iteration of the character, but Gray swiftly posits her as, post-Convergence capture, the new protector of Metropolis's Suicide Slum, a la the later Ed Brubaker version. Digging smartly into this era, Gray pits her against Intergang's Bruno "Ugly" Mannheim, a recurring Superman "Triangle Titles," etc. foe. The story stalls a bit in the first chapter with some repetition, but shines with understated romance once the Kingdom Come Batman makes the scene (Ron Randall's Catwoman and Mannheim are drawn well, though his armored Batman comes off awkwardly angular and square-faced). The ending here is far from "happy," but neither is the Zero Hour Catwoman's fate ignominious, which is what bugged me about the conclusion of Frank Tieri's Justice League in Convergence: Flashpoint Book One. Indeed I decried the swift and violent end of Tieri's Justice League miniseries over in Convergence: Flashpoint -- tonally wrong for those characters and that title -- but the same is wholly right for Suicide Squad. Artist Tom Mandrake is perfect here, both in conveying the appropriate atmosphere for Suicide Squad and in evoking the best of the 1990s overall (great that Mandrake gets in a Spectre cameo). Tieri matches the "classic" Squad (including the classic Amanda Waller) with two of the biggest bad guys of the time, Cyborg Superman and Bane, plus the 1990s Oracle, to great result. People die, as they ought to in a Suicide Squad story. Tieri also achieves the unexpected teaming of Cyborg Superman and (former Coast City resident) Star Sapphire Carol Ferris, with an entirely fitting outcome. That shadow of Cyborg Superman and "Death of Superman" predicate the events of the Superboy story, of course, and also Parallax gets a mention in the Green Arrow story. It's a subtle tying together of these stories that perhaps no other era can claim, and frankly I'm hard-pressed to recall another in-title event that had as much resonance in other titles as all of that -- Identity Crisis comes close, though that wasn't contained in one title. Obviously this common backdrop will continue into the second Convergence: Zero Hour with Parallax himself, the Matrix Supergirl, and Steel, at least. But the Superboy story, among those I was most looking forward to from the Convergence miniseries, is an immediate letdown. Writer Fabian Nicieza sets the book correctly in Cadmus, but uses Dr. Serling Roquette, who wouldn't appear until 50 issues into that Superboy series, letting alone that Nicieza inexplicably has this Superboy being called "Kon" (a name he wouldn't receive, from Superman, until Superboy #59). It's great to see Dubbilex again, but in using him Nicieza could have as easily brought in the Guardian, the Newsboy Legion, or Dabney Donovan -- and surely Tana Moon and Rex and Roxy Leech would have been a thrill (also I'd have put artist Karl Moline on Speed Force and brought Superboy artist Tom Grummett over here). For an era-specific Superboy story, it's not that era-specific. Nicieza also weirdly contradicts himself, establishing in the first chapter Superman's death at the hands of Doomsday (how it should have happened), but stating in the second chapter that the continuity's Superman was simply outside the Convergence dome when it fell. Lois Lane is only in this story briefly, but it would have been fascinating to see how she would have dealt with Superman's actual death had his resurrection never happened, had Nicieza decided to go there. Rounding out the book are Christy Marx's Green Arrow and Ron Marz's Justice League International. Each are fine visits with the Zero Hour characters; I liked the interplay between "our" Green Arrow and the Kingdom Come Dinah Lance, but the mechanism for bringing together Oliver and his son Connor Hawke is overly tangled, and Marx writes a too-wistful voice for Connor. Justice League does fine by the characters, but the emphasis is almost entirely on Blue Beetle Ted Kord; not that that's a bad thing, and the last page is worth the price of admission, but it does not feel legitimately like a JLI story. A final interesting aspect that ties these stories together is that in most if not all of them, the Zero Hour characters lose their Convergence contest to the Kingdom Come characters. "Losing" in this sense doesn't always bring bad consequences, but it is unusual to see so many stories where our heroes don't triumph; a nice change, actually, to the common "might makes right" aesthetic of superhero comics. If one were to create a "greatest hits" volume of Convergence, there's a couple from Convergence: Zero Hour Book One that would qualify. This book is a nice reminder of positive parts of that era. Sounds like I have to read Zero Hour and Death of Superman before this then. Well ... yes and no. There is some reference to those stories -- in Suicide Squad for instance -- though the references are somewhat minor; also the story you might think ties in the most, Superboy, is weird and contradictory in how it references those events. So you could read those two books beforehand (Death of Superman more than Zero Hour), but if you had a broad strokes understanding of Death of Superman, Zero Hour, Emerald Twilight, etc., then you might be OK without the pre-reading.